President’s Ambassadors are an elite group of special friends who are committed to the Zoological Society and our vision of being a world leader in connecting people to wildlife and conservation. President’s Ambassadors render the critically needed support and a true legacy of leadership that enable our crucial work of saving endangered wildlife to thrive. They are genuine philanthropists who help us secure the survival of the earth’s precious animals for future generations to enjoy. Special early hours at the Zoo — In recognition of your contribution and participation in the President's Ambassadors Club, you’re invited to enter the Zoo early from 8 to 9 a.m. the second Saturday of each month. "State of the Zoo" briefing with Zoological Society of San Diego Chairman. Wildlife Hero Talks —These engaging online conversations provide you with the opportunity to hear directly from our key conservationists about the projects taking place to save animals around the world. 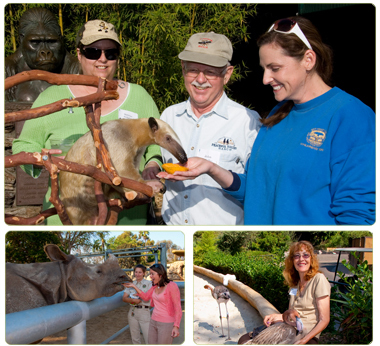 *Each President’s Ambassadors member receives a personalized membership card for unlimited admission to the San Diego Zoo and Safari Park along with two accompanying guests, per cardholder, per visit. Please note that the estimated fair market value of President's Ambassadors benefits is $423.